A very beautiful hooded cape, with neutral tones and 100% pure wool, which will keep you both warm and stylish for the colder season. This natural cape is designed from 100% luxurious pure wool. The opulent neutral tones accentuate a subtle herringbone weave. This cape includes a hood. Sophisticated and stylish, it is sure to be a fab accessory for the colder season. 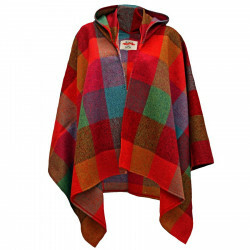 Wrap yourself warm with this hooded coloured cape made from Donegal tweed woven in Avoca’s mill.